Do you have a favourite Bible chapter? Many would choose 1 Corinthians 13. 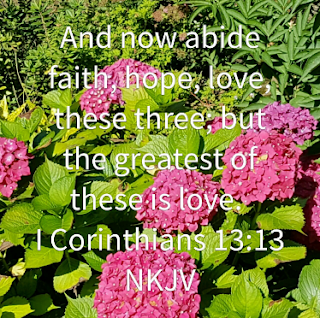 It concludes with the great three, faith hope and love. Do you have hope for a new year? The season is a time of change, and we are reminded that we are temporary residents, like Abraham. We then look for what abides, which must come from the God who is eternal (Mal 3:6). See 1 Corinthians 13:13. Faith must be prior, because we are saved through faith. Salvation is essential for hope or love. Salvation rests on God's faithfulness (Rom 4:20, Heb 11). There is no other way (Jn 14:6). Salvation is a GIFT, because He loved us. So we should be faithful, and reflect what God is like. Are we reliable? So God has a hope, just as we hope for our children. What do you most hope for them? for real saving faith! Love of God is shown in incomprehensible, unmerited grace. Why should he save us? One reason is that He made us, and so loves like a mother. So we should love - this is not just liking. We have love for God shown in seeking to please Him, and for others, in giving (love = charity), not just in the material sense. Greatest of these is love, because God IS love (1 Jn 4:10). Can we reflect this in what we are in our salvation? The attraction of the early Church was the visible love for each other that they showed.